Our Amish Furniture Bedroom Furniture English Shaker Chest of Drawers features traditional Shaker styling and Amish quality construction. This Shaker Chest of Drawers comes with 5 or 6 large drawers that allow for plenty of storage space. 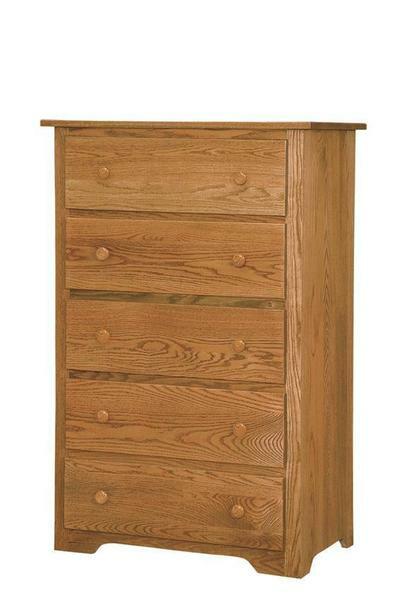 This Shaker Chest of Drawers is proudly Amish handcrafted in the USA! Please call with questions for one of our Amish furniture specialists at 1-866-272-6773. They can answer your questions on this Amish Shaker Chest of Drawers and other bedroom furniture items you are interested in! Thank you for the message. I have been out of town for business, but my wife said the package was delivered 2 days ago (Tu 2/2). She opened it and said it was an oak shelf. I will put it in the bookcase when I get back home. I appreciate your customer service. Given the flat rate shipping and the quality of the furniture, my wife and I were thinking it was too bad we didn't buy more. Regarding order id 71040, I had left a message on your voicemail this afternoon. Delivery was made in the early evening. I am glad they made the effort to deliver it today rather than tomorrow. No problems in setting up the bookcases and chest of drawers. The furniture looks very well made. There is no comparison in quality and appearance with the ones we had before. One bookcase is still useable, so I listed it on Craigslist for free. I am amazed at how many other bookcases from the same retailer are being listed for free.